so glancing, so improbable, so real. Happy New Year! 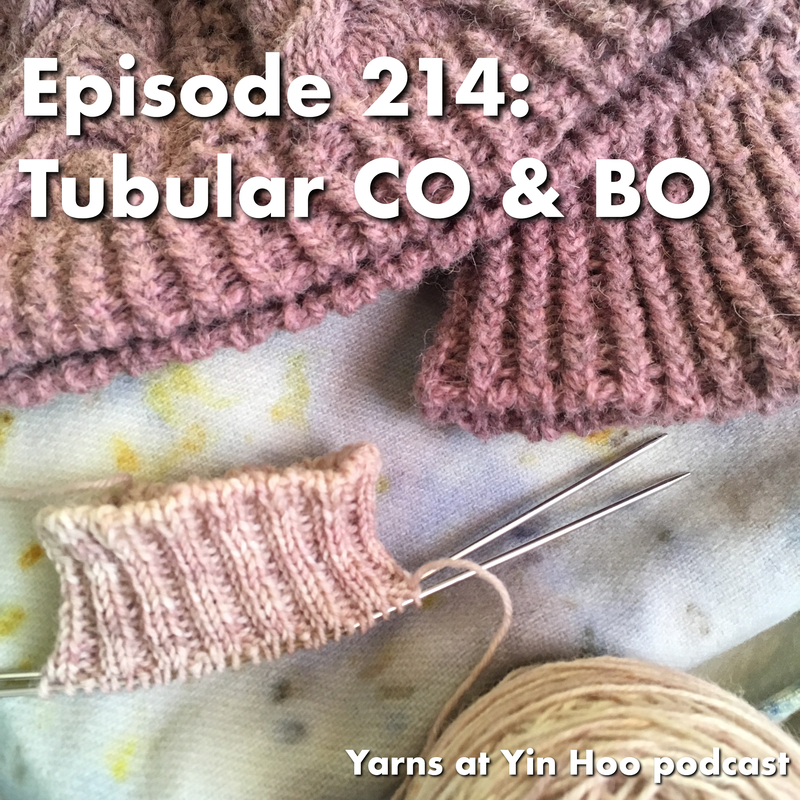 In this episode, I share an update on recent projects, and respond to prairiepoet’s question about the tubular cast on and bind off that I have referenced so frequently over the past few years. It has really become a favorite set of techniques. 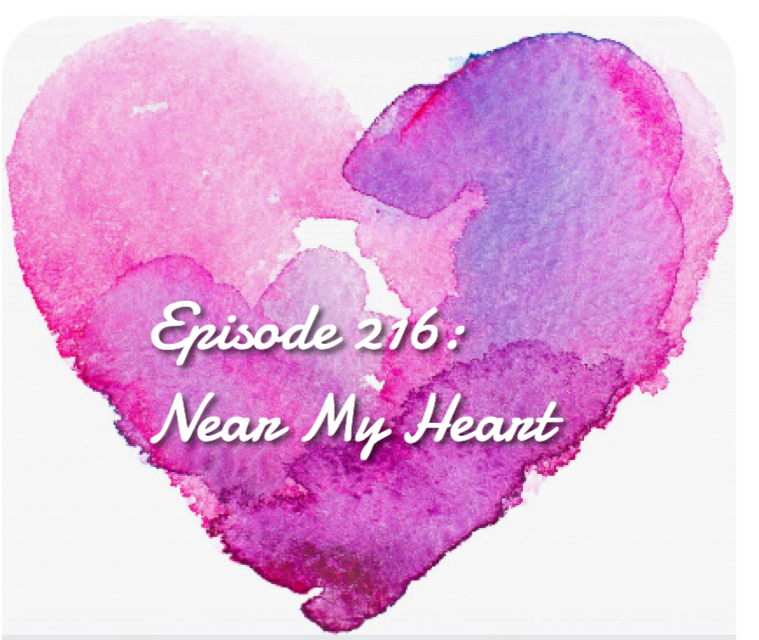 If you haven’t yet tried them, I hope that this episode provides some inspiration and encouragement. 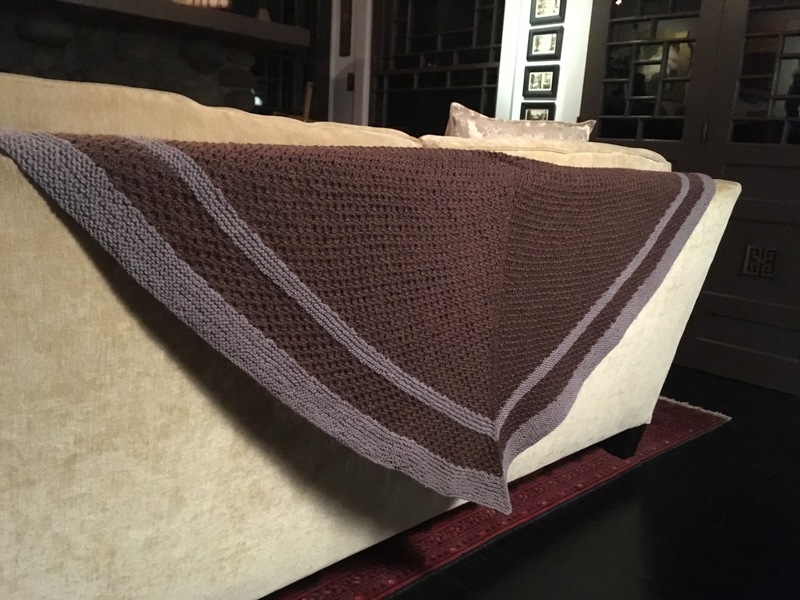 I also hope that knitters experienced with these techniques will share some of their tips and suggestions on the episode thread in our YAYH group on Ravelry. A new four-session series begins on February 2nd at Hope’s Favorite Things in Richmond, PA. Send me a PM if you have questions about this course, or call Hope’s shop to sign up! 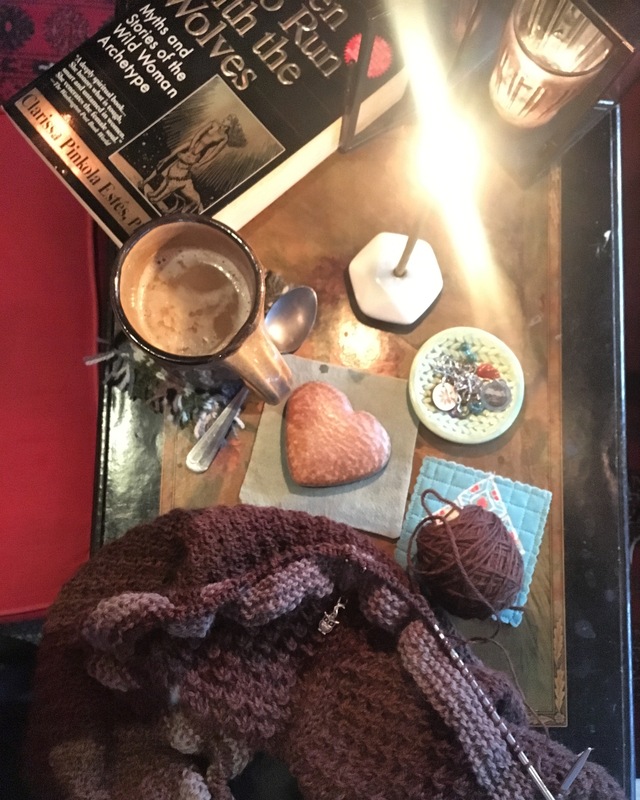 I completed the Wood Hollow Hat & Mittens set designed by Kirsten Kapur and I am just in love with these warm woolies for the cold weather. Knit in Blacker Yarns TOR from The Woolly Thistle and topped with a fur pompom from Hope’s Favorite Things. 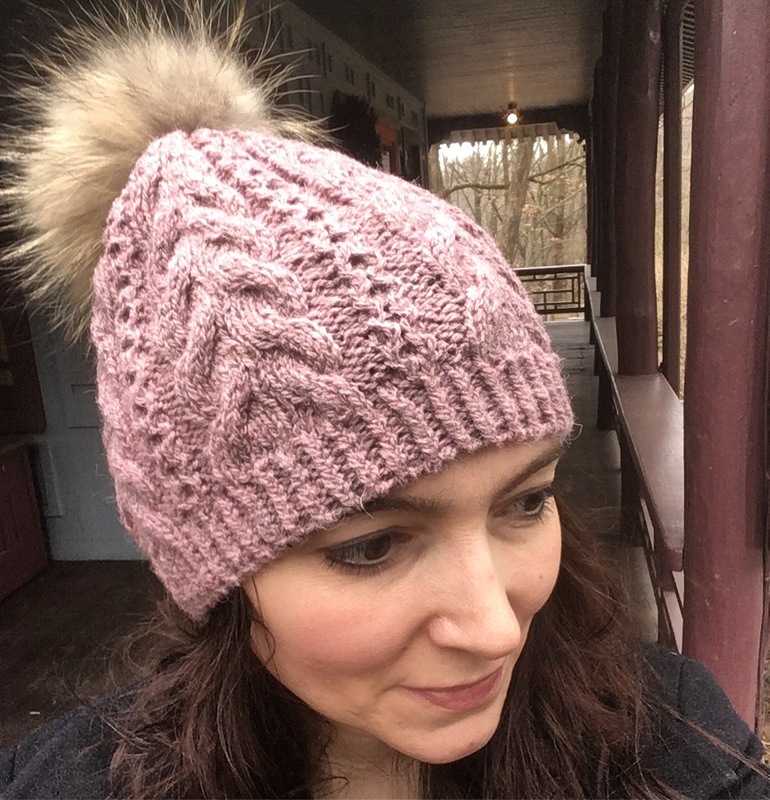 I began this hat with a tubular cast on on US 3 needles; when I joined to knit in the round, I shifted to US 4 needles and worked a twisted rib. Working the Hedgewitch Shawl along with so many wonderful knitters has been one of the joys of my holiday season. With only the border left to knit, I feel confident that I will complete this project by January’s Wolf Moon. 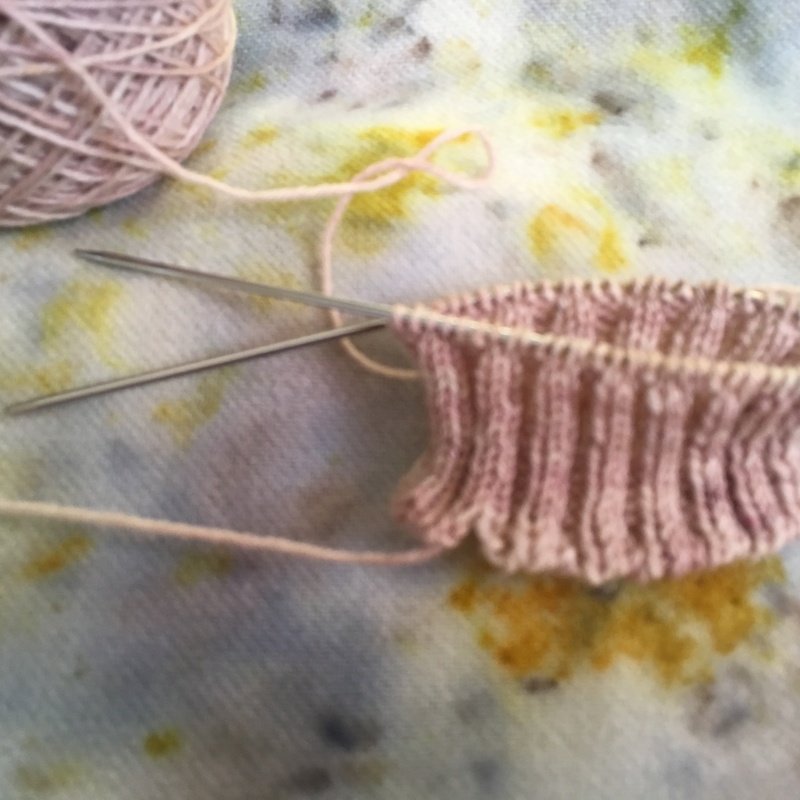 The tubular cast on method I use requires knitting the piece flat for the first few rows, then joining in the round. 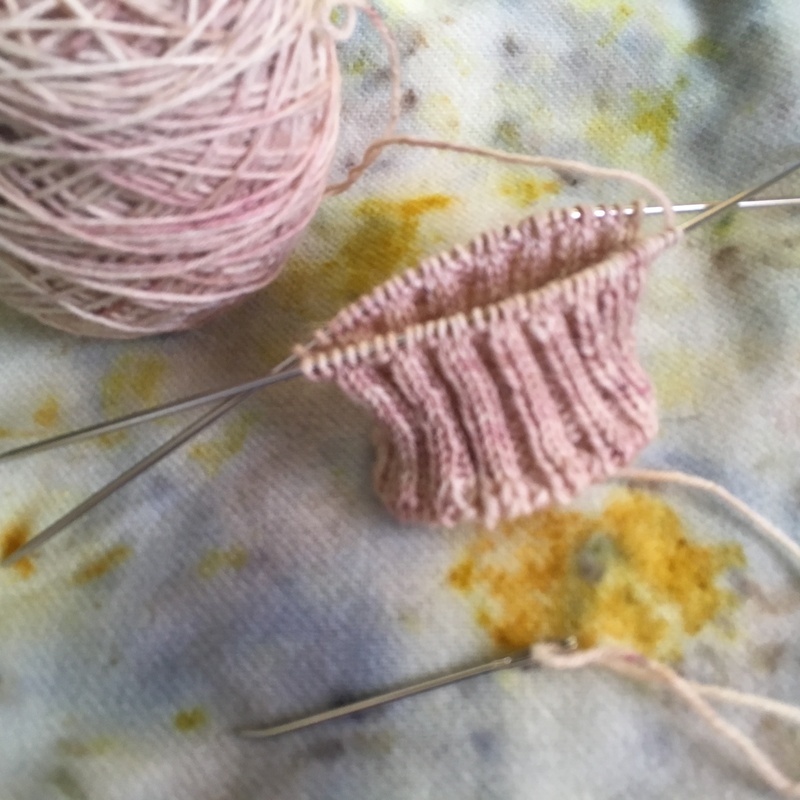 This results in a gap, as you can see in this photo of my sock cuff. Use the tail of your long-tail tubular cast on to seam up the gap. 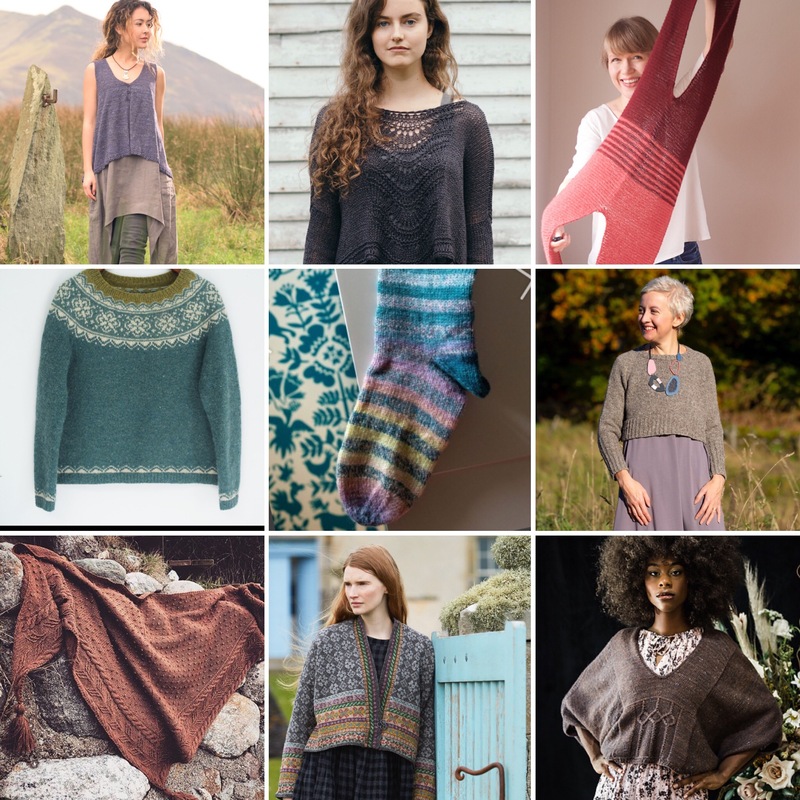 How many knitting projects is the perfect number of knitting projects? For me, three is ideas. Any more, and projects languish. Fewer, and I don’t do as much knitting. 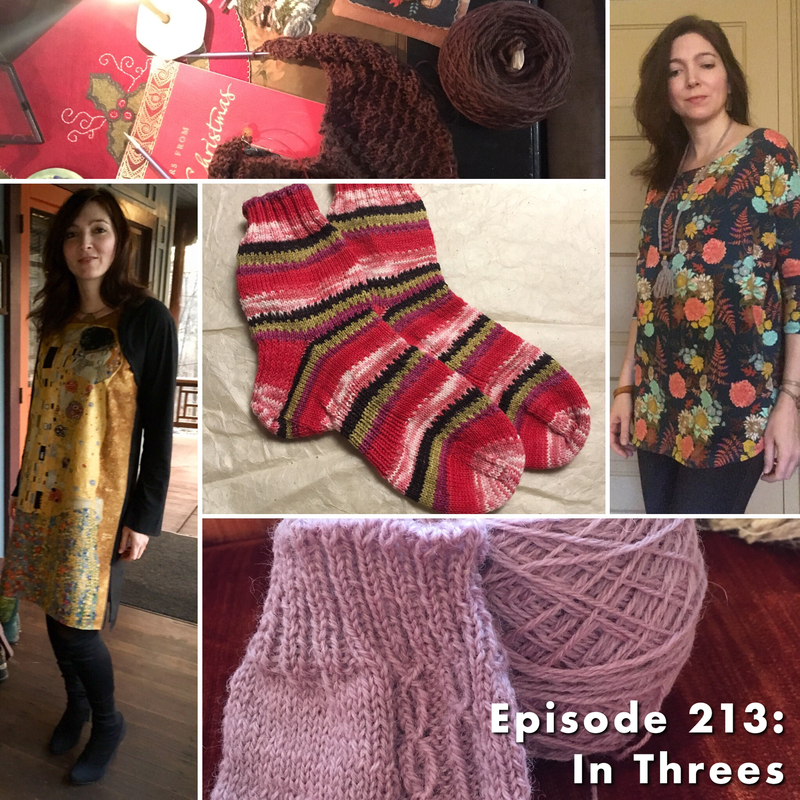 Since the last episode, I’ve completed three knitting projects and three sewing project. 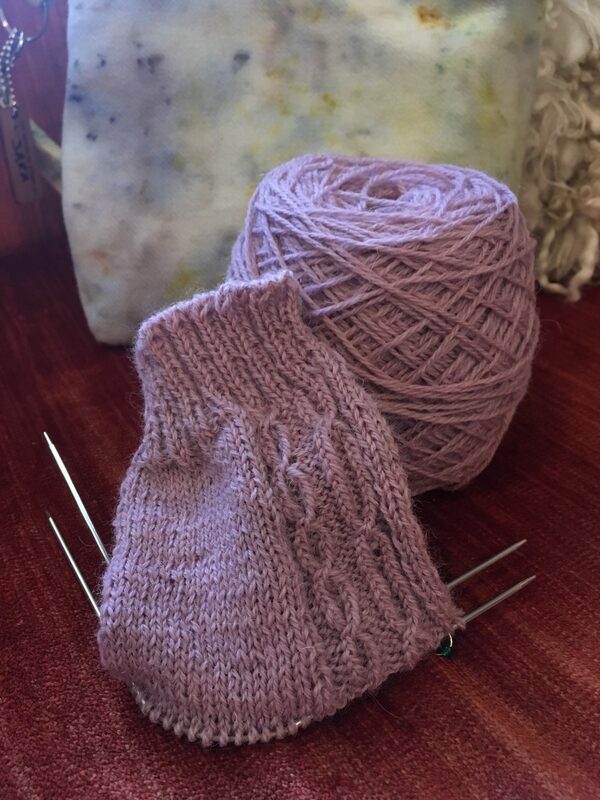 Plus, I have three new things on the needles. I’m smitten with this little ceramic village by Allison Borthwick of Buchlyvie Pottery. 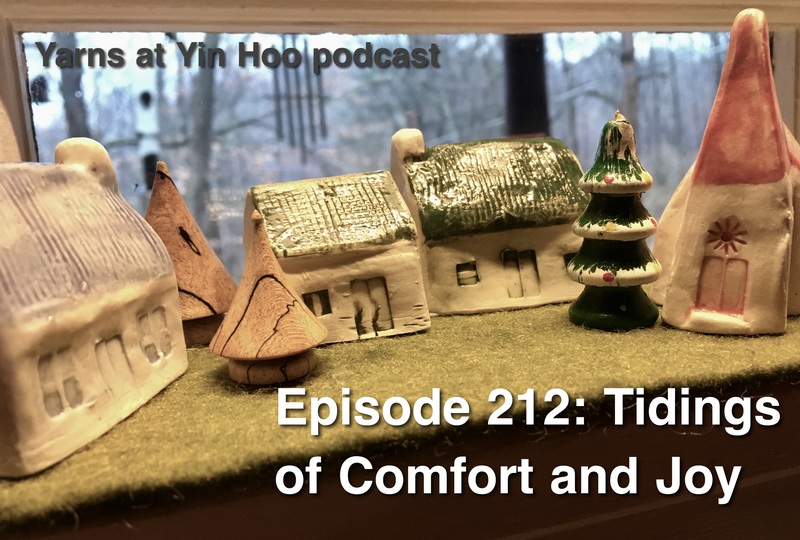 It’s such a charming addition to our holiday decorations and sits in tranquility on my kitchen window sill. 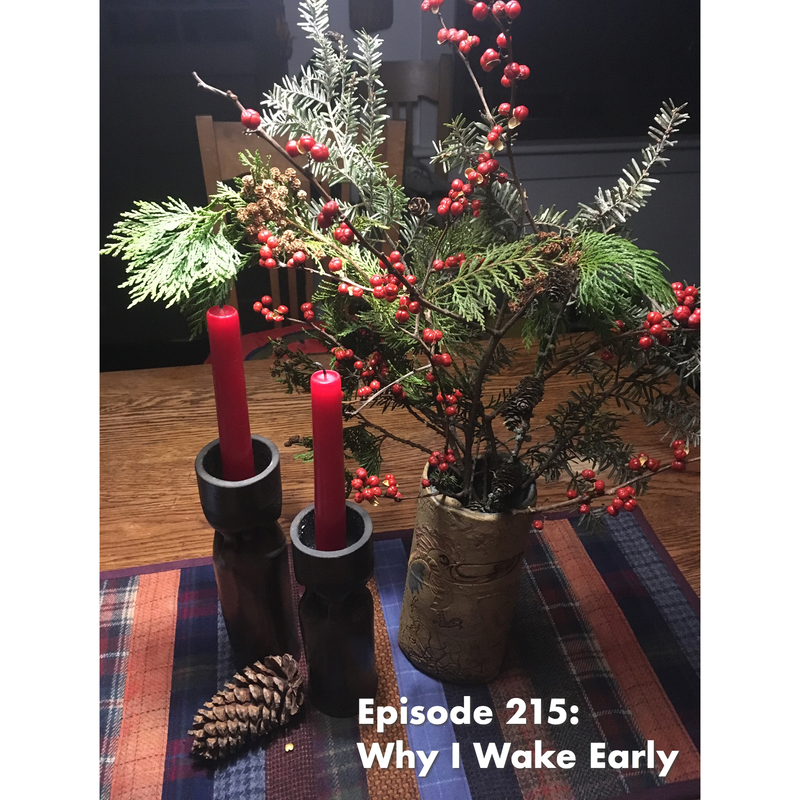 At the opening of the episode, I go on quite a bit about IndieMart in Narrowsburg, NY. Some other spots I mention are The Heron and Tusten Theatre. 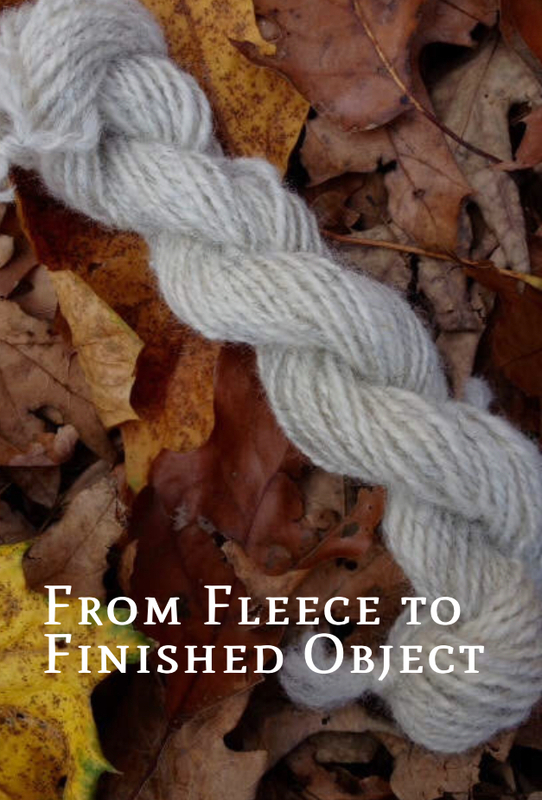 Did you miss out on the fall/winter sessions of From Fleece to Finished Object? I’ll be starting up a winter/spring series beginning in February. 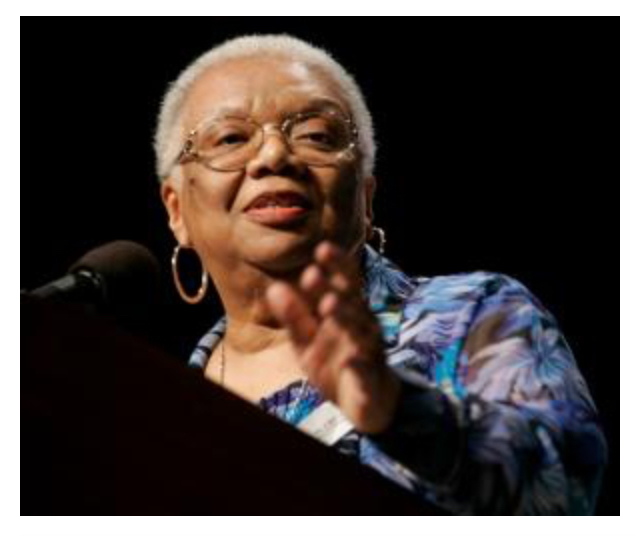 Check the details on the website of Hope’s Favorite Things and call the shop to sign up! 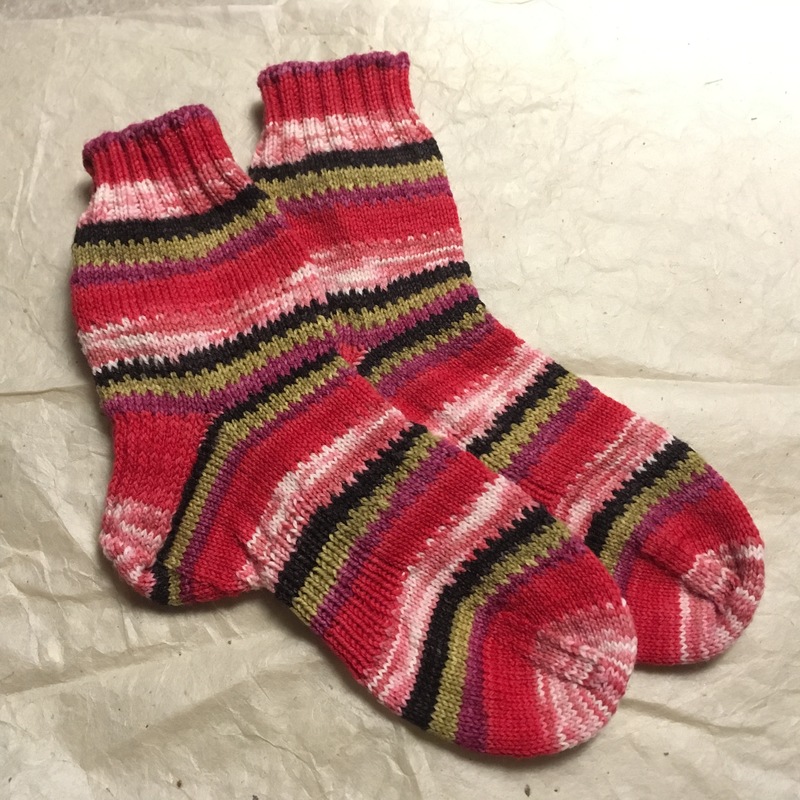 Here’s a glimpse of my recent sock design, to be published in early February. 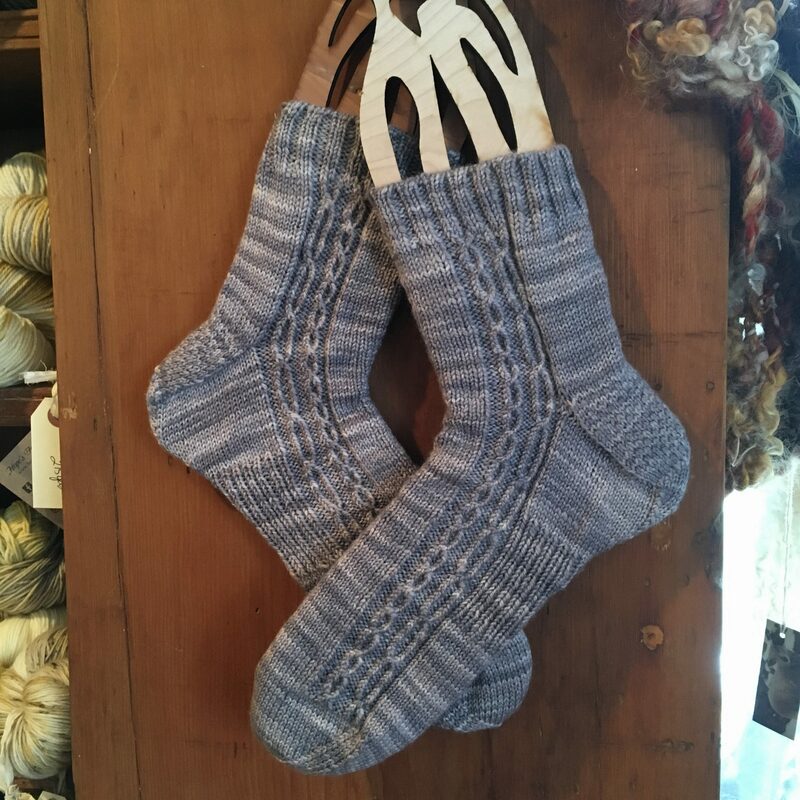 The pair you see here is knit in Carole Foster’s Northumberland 100% USA made superwash merino/nylon blend–dyed by Carole. 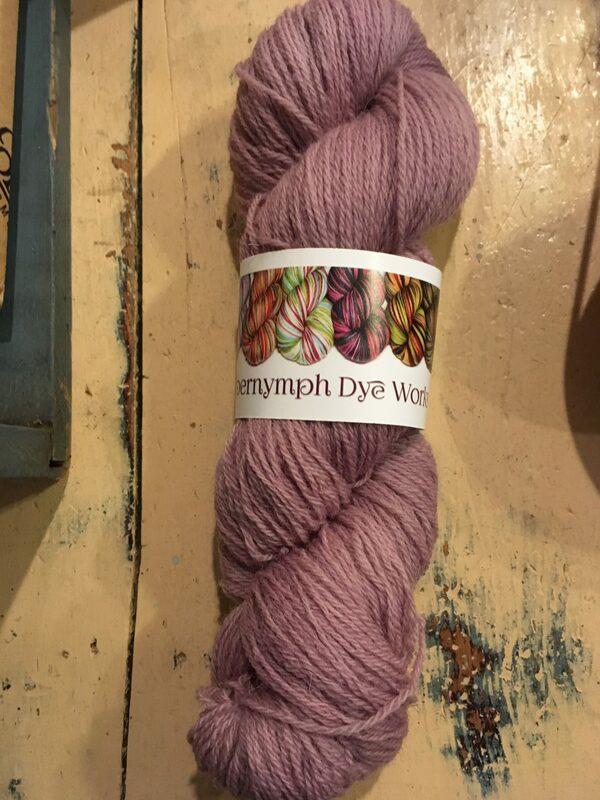 As I knit along with my test knitters, I’ll be trying out a new base from Lisa of Fibernymph Dye Works. The color here is Wild Bergamot. Isn’t it gorgeous? I’ll be reporting back with my impressions of this new base as I knit. 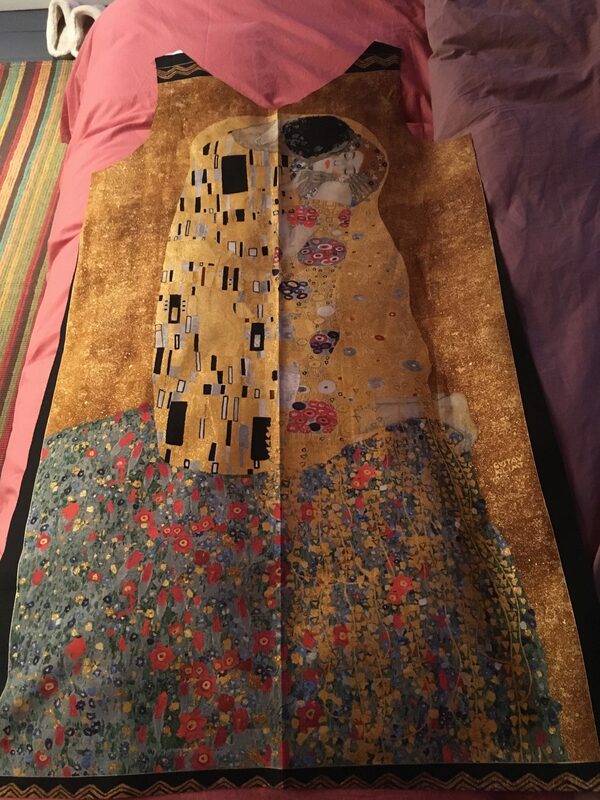 Gustav Klimt’s THE KISS cut into a front dress panel. This could be a very cool holiday frock or a total disaster. I’m going to use the burrito roll method and try for a completely lined dress. 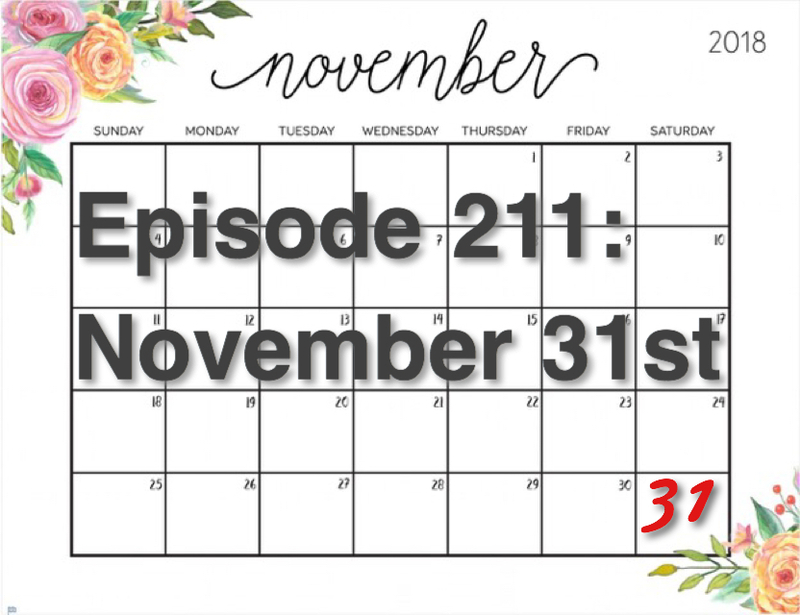 What’s November 31st? It’s a holiday for knitters. How do you celebrate? 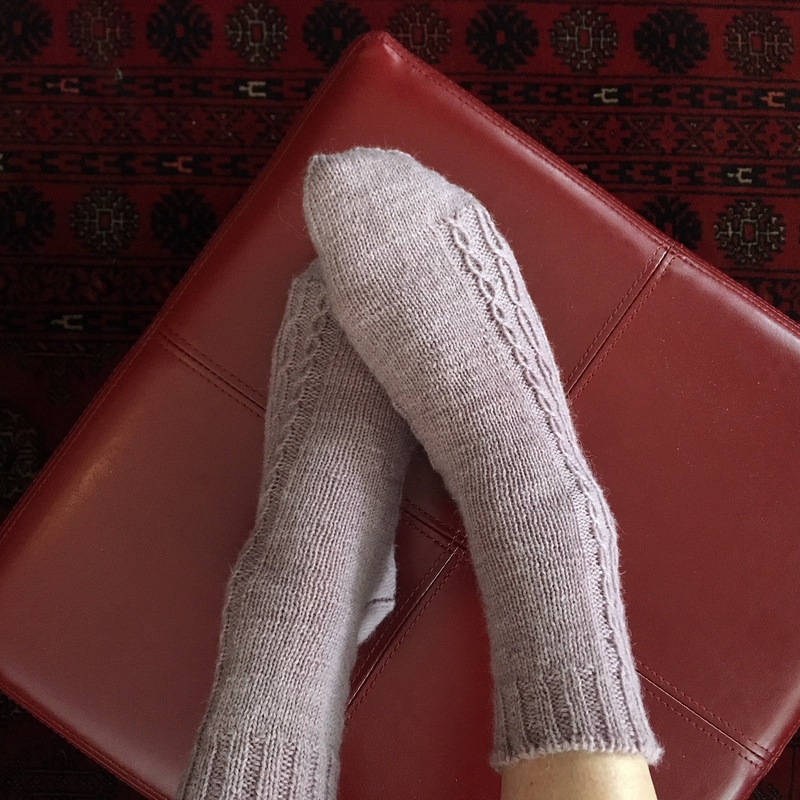 Stay up late to complete the project you had all month to knit. 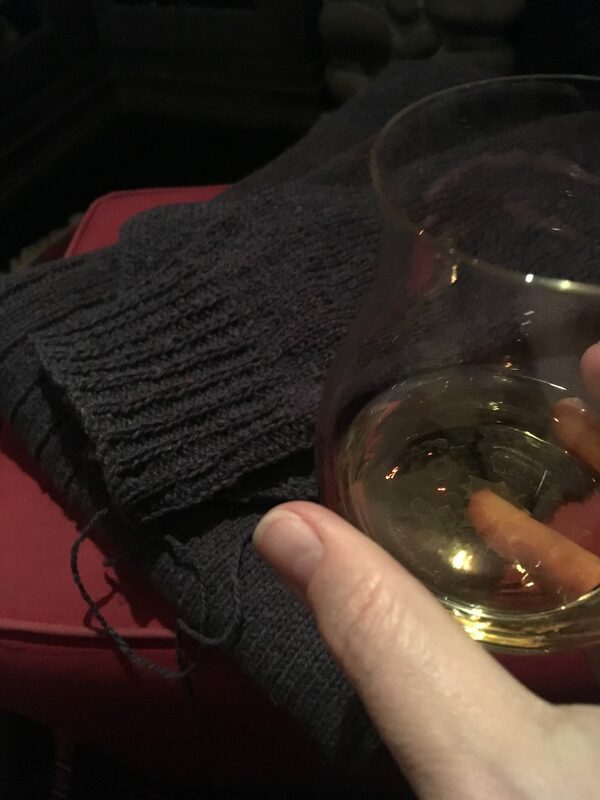 Around 11:45 pm, pour yourself a Scotch to celebrate while you bind off! Midnight libations! I still have a lot of finishing to do on my tunic-length version of Doocot by Kate Davies, so I’ll post photos to my project page later. 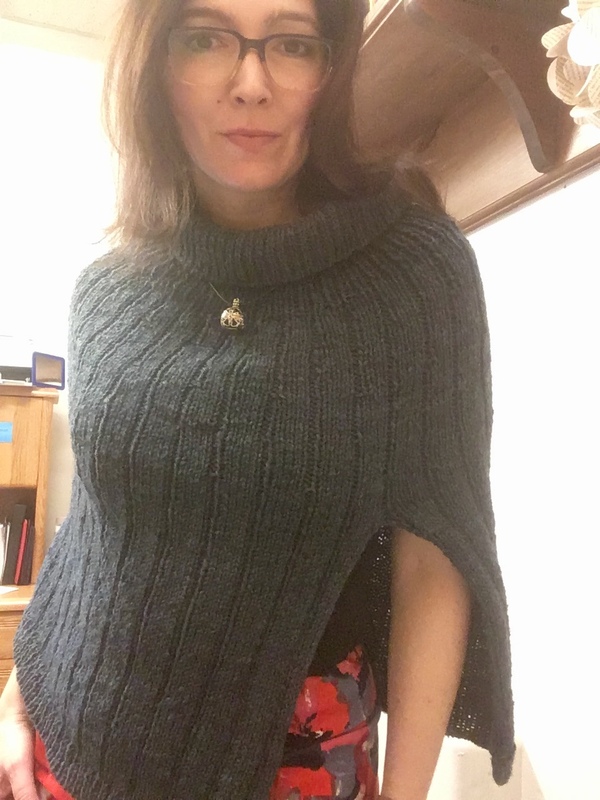 For now, here’s the designer modeling her cropped sweater. 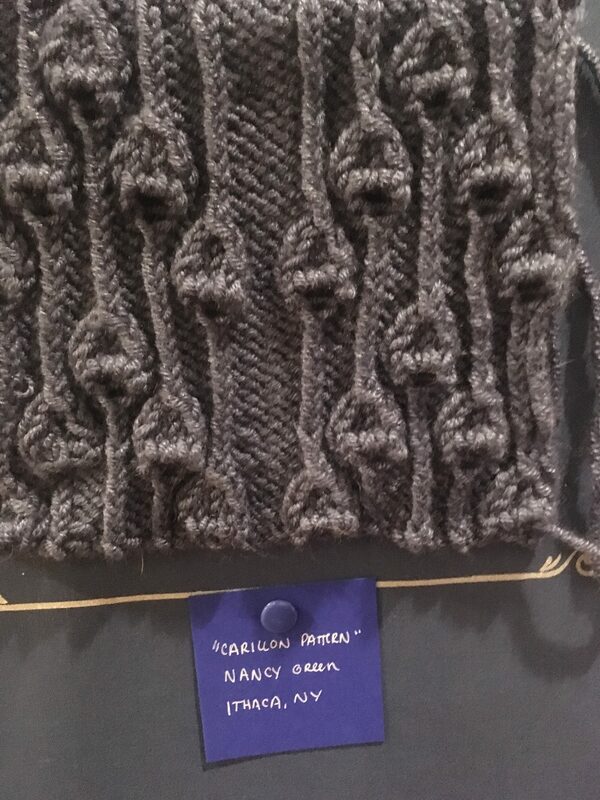 I think that I do want to knit this version. 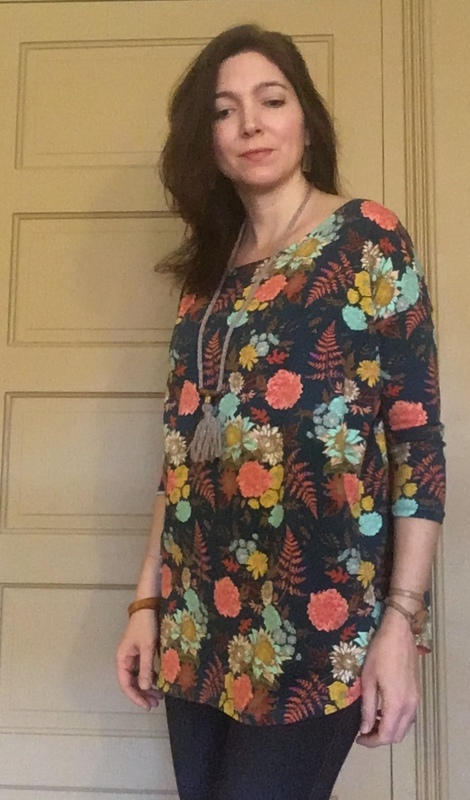 I think the piece would pair well with sleeveless dresses and extend my warmer weather wardrobe into the colder months. 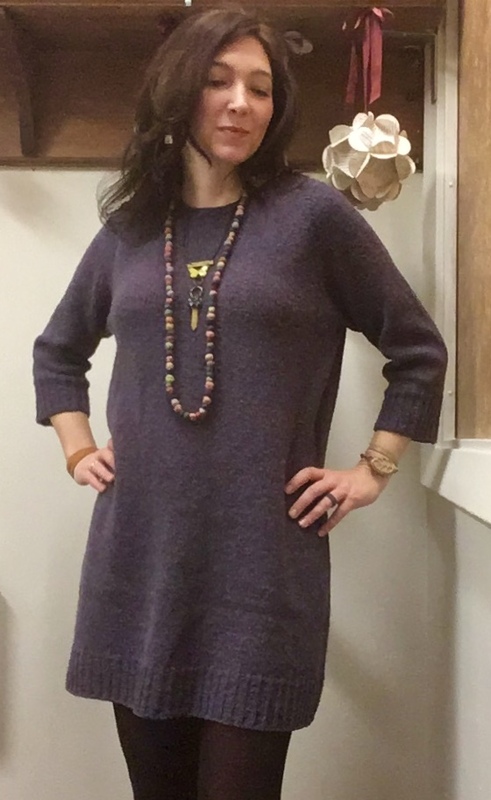 Look how good this is with a bold necklace! 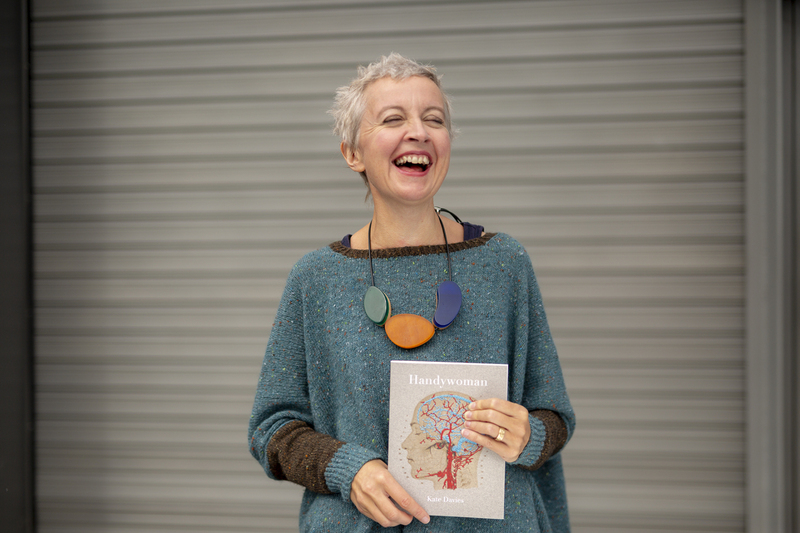 This week I share a passage from Kate Davies’ memoir, Handywoman. 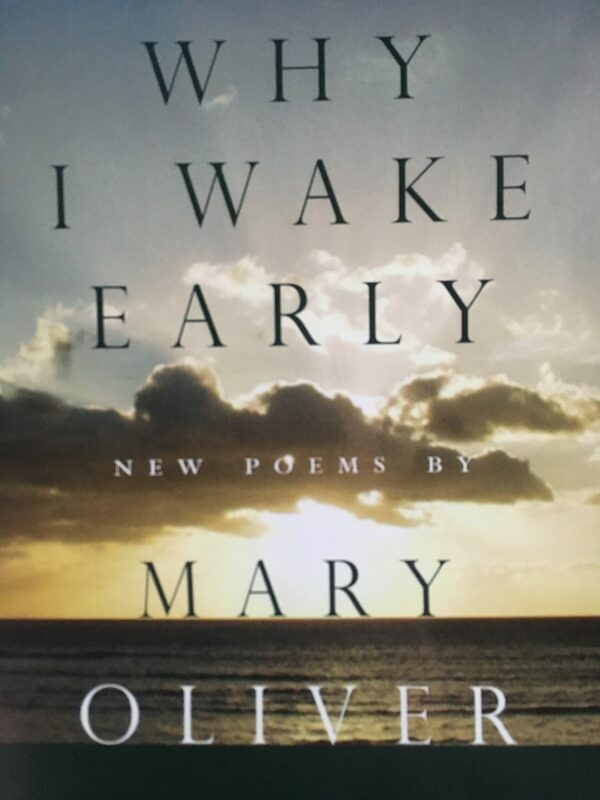 I purchased my copy from The Woolly Thistle and I’m really enjoying it. I didn’t take any photos, but I’ve made Eric Kim’s recipe for Sheet Pan Chicken several times. I use a package of six boneless, skinless chicken thighs and find that the spice blend is enough for two dinners, so I reserve half in a small container to make the next preparation EVEN EASIER! On another sheet pan, I spread a mixture of vegetables (potatoes and carrots or broccoli and Brussels sprouts) that have been tossed in olive oil and sprinkled with salt. The chicken is great the first night and even better in the dishes I dream up over the course of the week: quesadillas, rice bowls, grain salads . . . the list goes on. 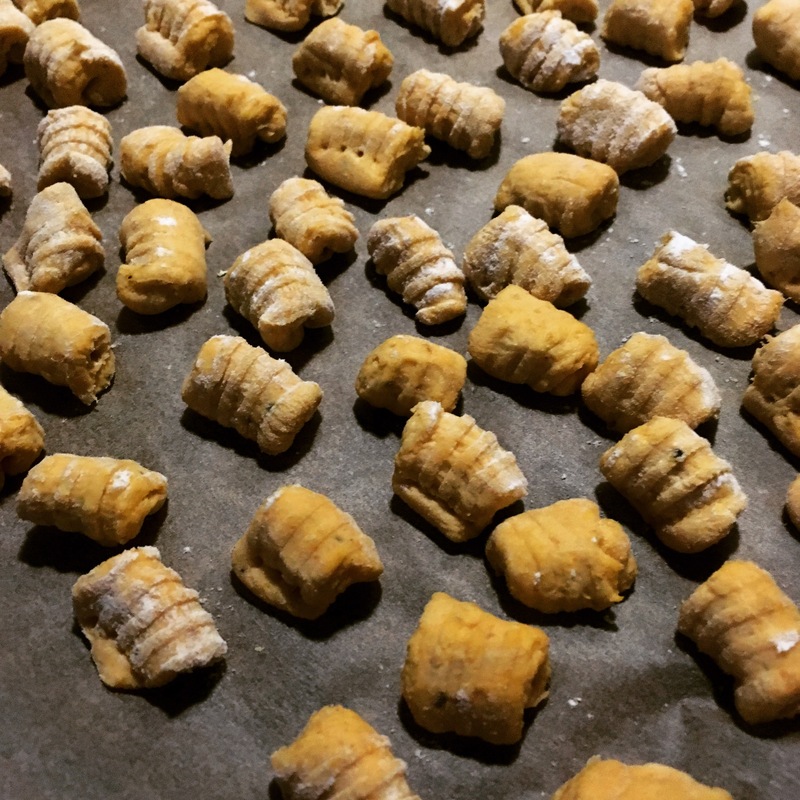 This is my favorite recipe for pumpkin gnocchi. I’ve used canned pumpkin, but I may try sweet potatoes in my next batch. I say that this recipe is from Food52, but I found it on Recipe Tin Eats. The ricotta makes these gnocchi pillowy soft and the dough is easy to handle. One batch is enough for two dinners. 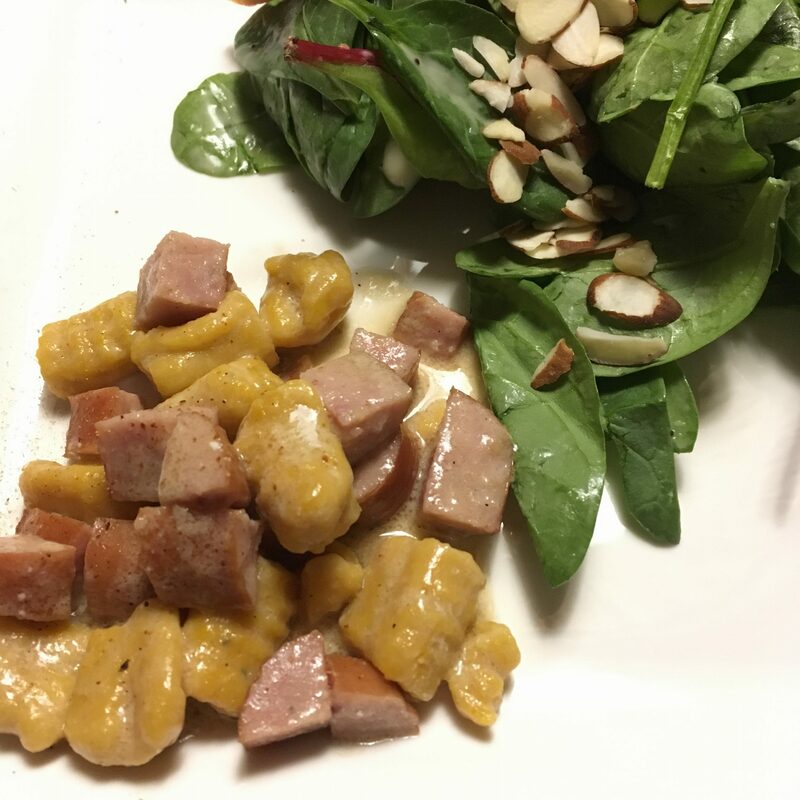 I reserve half the gnocchi and put the remainder on a sheet pan to flash freeze and then bag for an easy meal. I like these gnocchi with a creamy sauce., but the sage butter is also very good. There were some chicken-apple sausages in my freezer, which were perfect in the dish.